The Bronx Community Center combines Homeless Housing and Resources along with a Community Center. 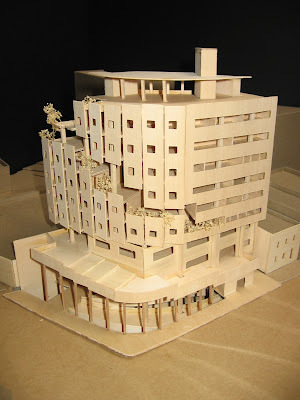 The primary goal is to attempt to address the negative perception of homelessness using architecture. This is accomplished by creating areas where residence of the center can interact with community members. The site of the Bronx Community Center, within Community Board 4, was chosen for a number of reasons. The area has one of the highest concentrations of homelessness within the City of New York with the a limited number of facilitates. Additionally, the relatively high number of people receiving community assistance within the surrounding neighborhoods demonstrates a need for employment and personal development resources. Therefore a facility that benefits residents and the homeless alike is likely to improve the community as a whole. Included in the center is housing for homeless, a thrift store, workshop, gallery, laundry, daycare, employment and counseling offices, personal development resources, classrooms, community farming areas, and dining facilities. Chance encounters are encouraged between community members and homeless residents due to the fact that all services are open to both the public and residents. This provides the opportunity for interaction which otherwise would not happen. 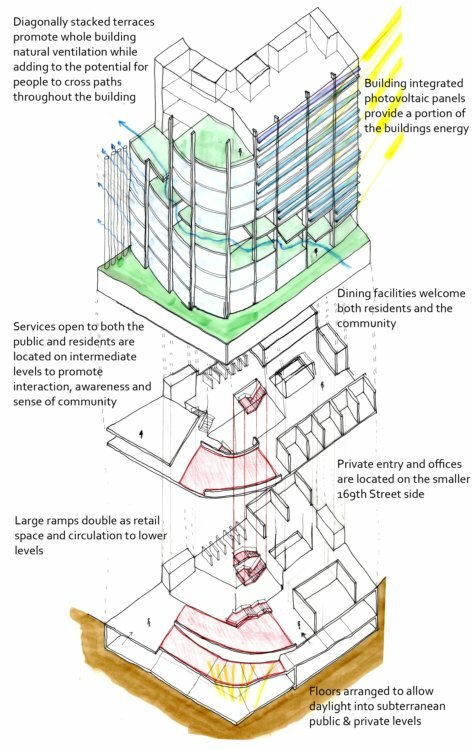 Spaces on the lower public levels overlook each other and weave together to further promote interactions. The building addresses energy and environmental issues as well. Energy efficiency measures are incorporated and include day lighting and natural ventilation as well as active energy generation systems. 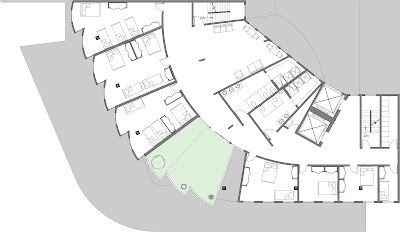 A large green space, adjacent to the communal dining area climbs up the building, offering semi-public gardens at each floor. These series of green spaces culminates at a green roof which helps facilitate whole building natural ventilation while providing a community garden to grow edible and ornamental plants and helping to grow the local ecology. The scalloped shape of the buildings West elevation takes advantage of the prevailing winds to aid in the ventilation of the adjacent living units. Renewable energy is incorporated with Building Integrated Photovoltaic’s (BIPV) on the South elevation and Vertical Access Wind Turbines on the roof. 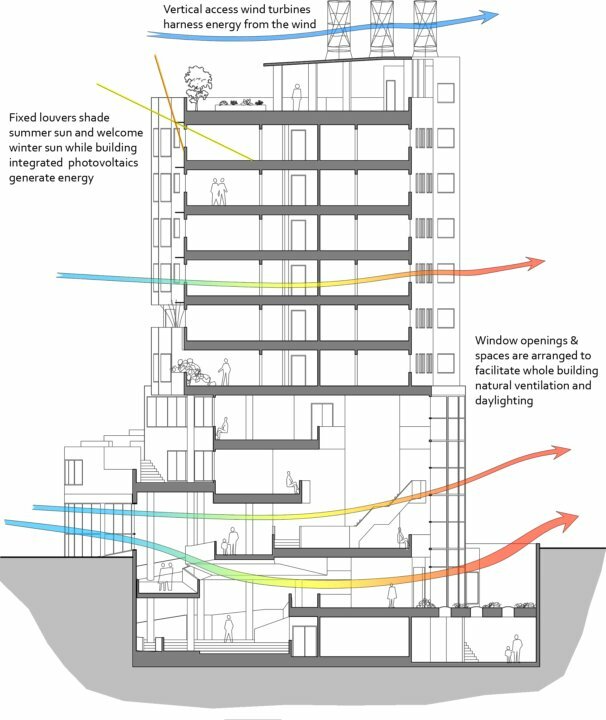 The Building Section shows the vertical complexity of the interior spaces which provide overlooks into spaces below. This adds to the connectivity between community and residents, while allowing ample daylight and helping to facilitate natural ventilation. The ground floor has a large open public entry along the more active Gerard Avenue and a smaller private entry along the residential scaled 169th Street. 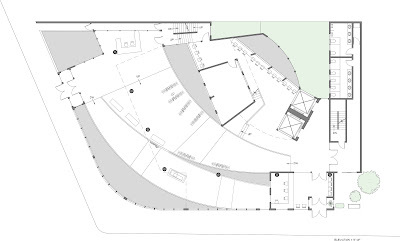 Ramps provide circulation between ground floor levels due to the different elevations at each entry, while also providing space for programmatic elements including a thrift shop and gallery. The interconnection of these spaces provides interaction opportunities between residents of the Center and members of the Community. Residential floors, each of which includes a green/garden space as well as a gathering space, have interior partitions and storage that are easily adaptable to conform to the needs of the residents at any given time. An ultimate goal of the Bronx Community Center is to largely eliminate the problem of homelessness at which time the building can continue to offer valuable resources to the community at large while possibly offering short-term housing for students, temporary workers, and visitors.